The highly anticipated 12th installment of the Rue Morgue Library is now available for pre-order! 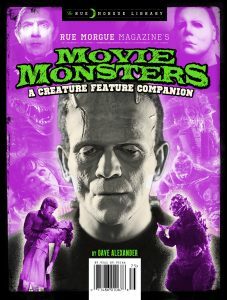 In it, former Rue Morgue Editor-in-Chief Dave Alexander presents a fun and fascinating look at the world of MOVIE MONSTERS, from the silent era to the present day. Featuring human monsters, nature run amok, shape-shifters, classic creatures, science gone wrong, aliens, and creepy crawlies from the darkest recesses of the imagination, this is a monster manual every genre movie fan should have. Plus! Compelling essays into the world of creature features, along with rare, new and previously unpublished interviews with movie monster visionaries such as Guillermo del Toro, Robert Englund, James Gunn, Dan O’Bannon, David Cronenberg and more! The perfect bound, soft cover, 76-page book retails at $9.95 and ships October 1, 2017, just in time for Halloween!